June is National Safety Month, so Amica Insurance is sharing 10 reminders to promote wellness inside and outside the home. 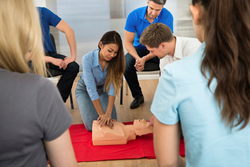 As part of National Safety Month, the National Safety Council encourages everyone to become certified in first aid and CPR. Always watch children around water. Keep emergency phone numbers nearby. Be aware of medication interactions. •Fall-proof the bathrooms of older adults. Pay attention to where you are walking. Practice driving with teens, even after they get a license. Focus on the road instead of distractions.